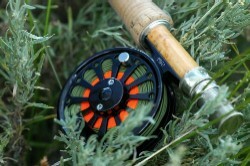 For the inaugural edition of the new Midcurrent Fly Fishing Gear Blog, I thought I’d start us off with a little nostalgia: what is your favorite piece of fly fishing gear that’s no longer on the market? It doesn’t take me long to select two pieces of gear that fit the bill: the Simms Guide waders and the Ross San Miguel 2 reel. Simms Guides are the waders that started it all; the exploded micro-fiber face finish offered softness and eliminated that annoying ‘scrape scrape scrape’ when you walk, while the five-layer Gore-Tex from the knees down meant you could literally walk the booties off the wader before the fabric failed (I’ve done it). I’ve got two pairs; one circa-2000 (re-bootied in 2003) and one from about 2005. While the absence of pockets, wool-liners, or a zipper might mark them as dated, I like simplicity and I’ve never been more comfortable in a pair of waders. Meanwhile, the Ross San Miguel 2 might be the best trout reel ever made. Over-engineered almost to a fault, with four ball bearings, a sealed drag, and a midnight black Knight Rider-era finish, this little reel (and it is far littler than modern large arbor reels) is one of the smoothest, slickest pieces of hardware ever made for fly fishing. You usually see this kind of engineering only in high-end custom automotive or industrial kitchens. At $425 in 2000, the San Miguel wasn’t for everyone, but you’ll still see many of these reels hiding out in their old-school royal blue bags among many guides’ private equipment. What’s that special item lurking in the back of your gear bag, never to be sold or given away? Answer in the Comments section!